Loves growing on old walls. In gardens it can add a decorative touch to walls when transplanted into them. 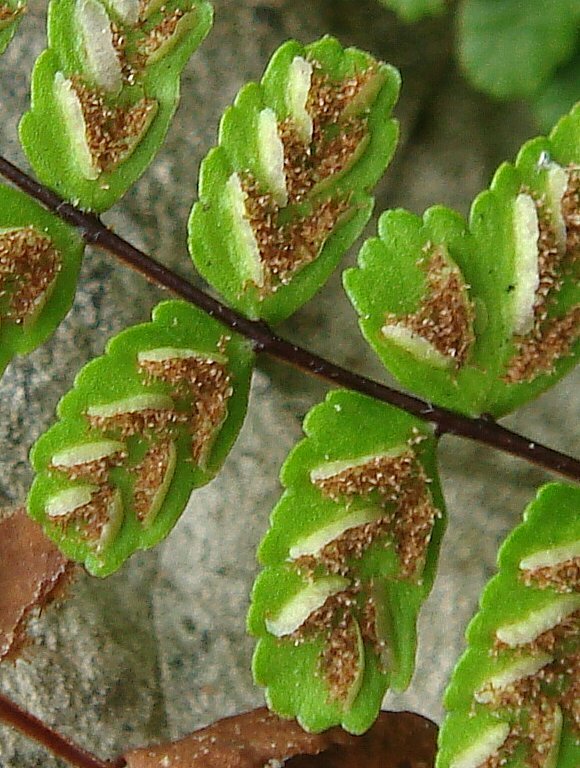 Individual leaves are 5 to 20cm long. Leaflets are short, about 1cm long, and on each side of a central blackish stalk, and getting shorter towards the end of the stalk. 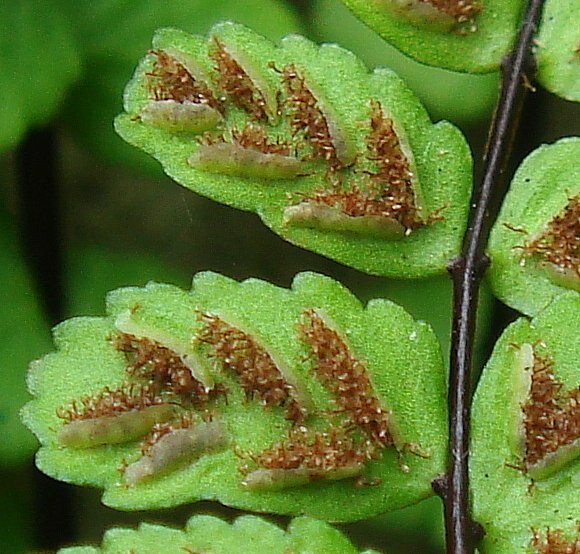 Leaflets are slightly roundly toothed and opposite each other in pairs (un-like Alternate-leaved Maidenhair Spleenwort . Spores on underside of leaflets ripe between september and october. Note withered old stem with brown leaflets below. Spores in the nooks of semi-transparent folds. Stalk round and blackish. 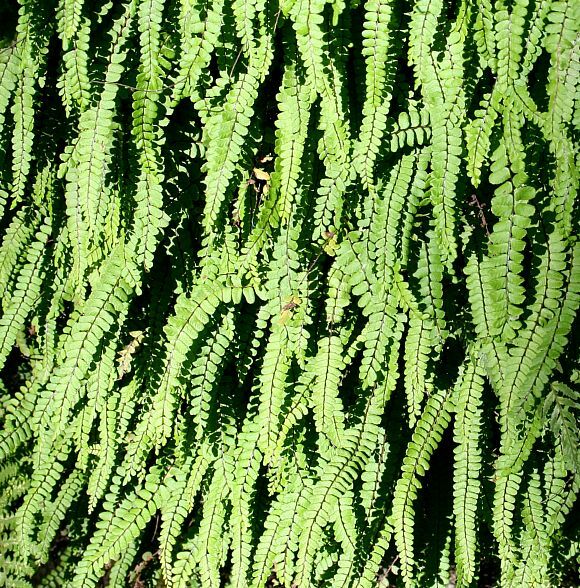 Some similarities to : Green Spleenwort but that has green stalks and mid-ribs (rachis), rather than blackish, and to Rusty-back but that has alternate leaflets attached to the mid-rib along their widest part rather than at a single point as in Maidenhair Spleenwort. 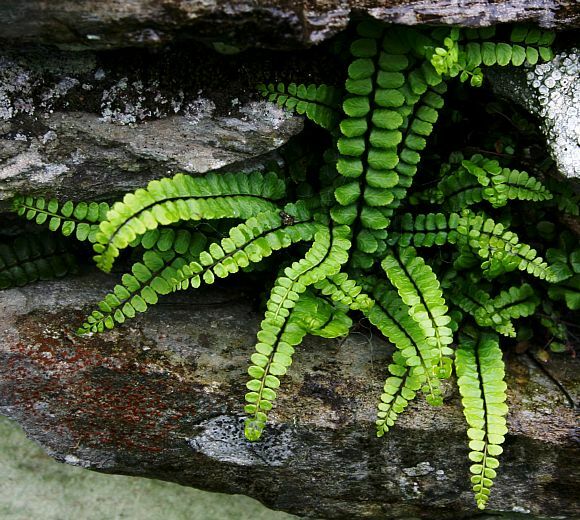 Inhabits old walls and rock faces, concentrated mainly in the west of the UK, but is found in all places. 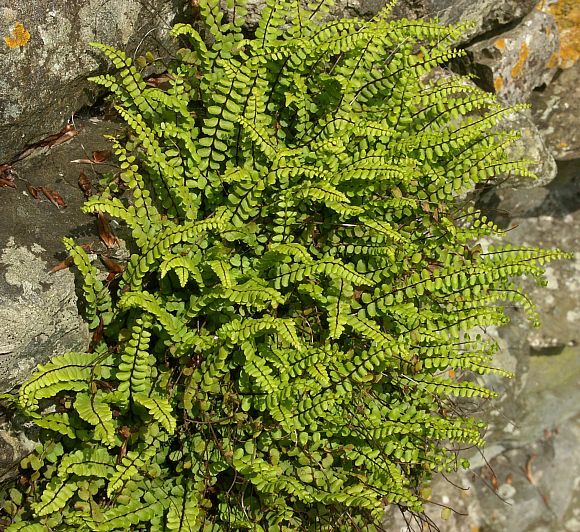 Far more common that is Green Spleenwort, which, in the UK, occurs only in the west. The central park of the blackish stalk has scales. 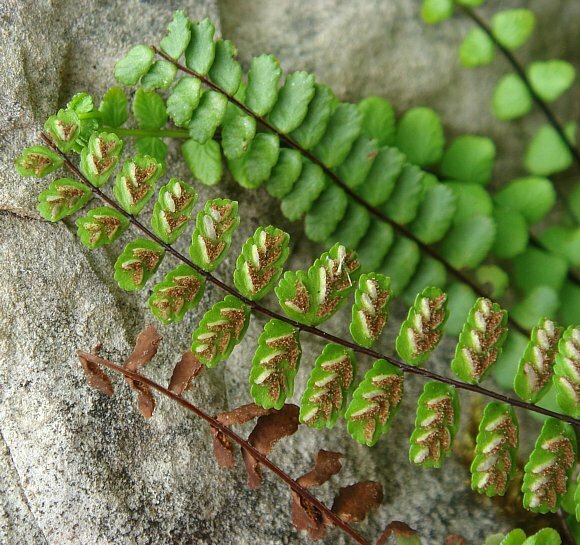 No close relation to: Maidenhair Fern or Maidenhair Tree [plants of a similar name]. 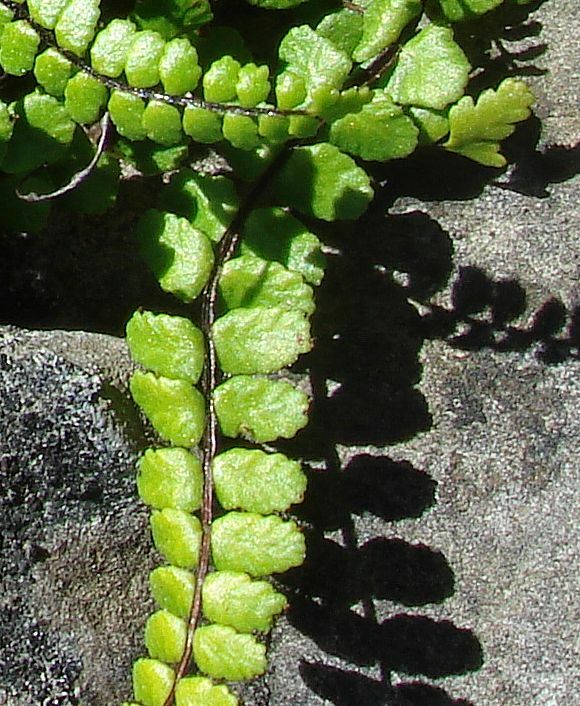 Maidenhair Spleenwort (Asplenium trichomanes subsp. quadrivalens) which has symmetrical oblong (rectangular-ish) leaflets. 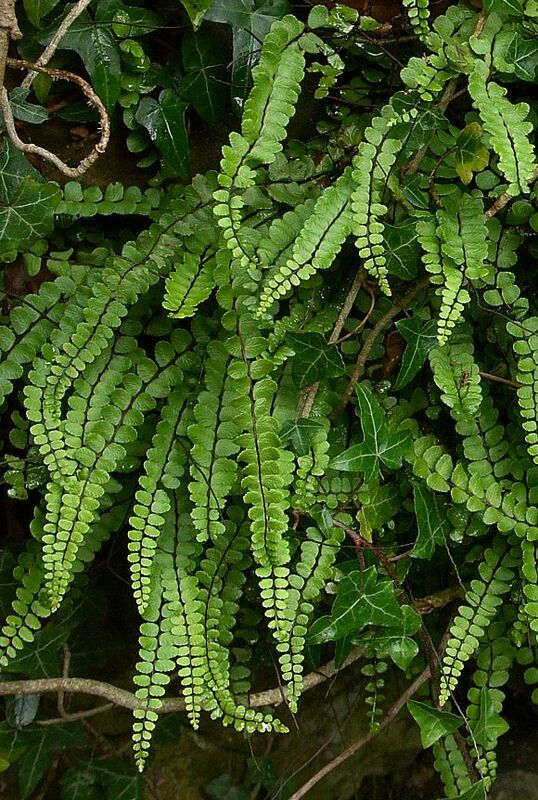 It is not known if any of the above photographs correspond with any of these; the two sub-species of Maidenhair Spleenwort are slightly less ubiquitous that the pure-bred, whereas Lobed Maidenhair Spleenwort is only found in very few localities in the UK. All three are very similar and are often distinguished only with difficulty, the size of the spores being the only truely reliable way! Once again, it is un-known if any of these hybrids correspond with any of the above photographs.